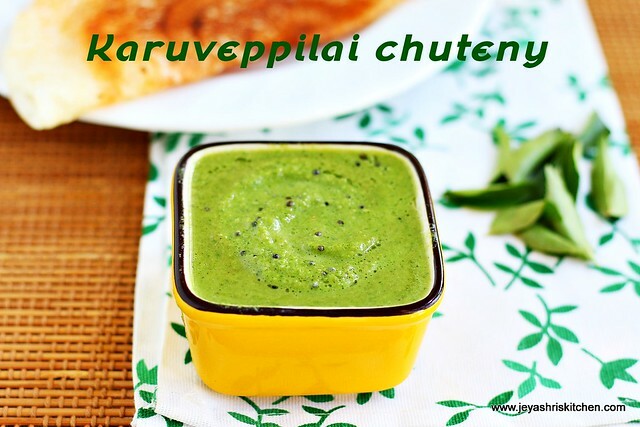 Curry leaves chutney | karuveppilai chutney is an easy chutney recipe, with karuvepillai |curry leaves as the main ingredient. I have tried this at home few times for morning breakfast but never had the chance to click the picture to make a post the recipe of chutney. 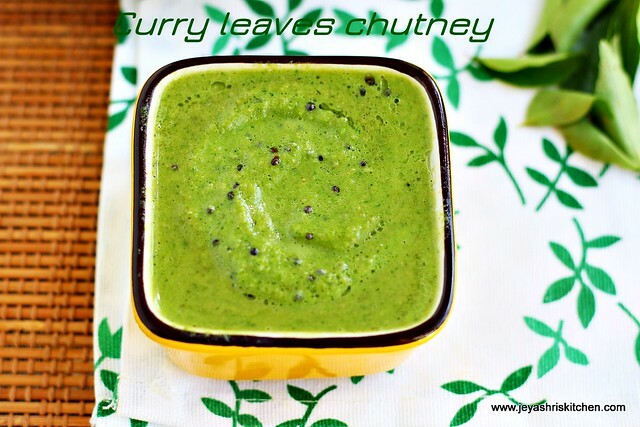 Today i was making batter of kambu dosa for the dinner and thought will make this chutney and keep it for dinner. The vibrant green colour of the chutney attracts kids and it is the best way of making them to include curry leaves into their food. You can also add few mint leaves to this and spread on bread, while making sandwich. Check out my other chutney recipes. Wash the curry leaves and pat dry them. Peel the skin of garlic and onion. I used small onion, you can use big onion too. In a pan add 2 tsp of oil and add the urad dal,green chili and garlic, when it starts changing colour, add the onions. Cook this on a low flame till the dal turns golden brown and the onions starts shrinking. Add salt to the onions while cooking. This makes it cook bit fast without getting burnt. Once they are cooked add the curry leaves and saute for 5 seconds and switch off the flame. Let the curry leaves gets cooked in the pan heat only. Grind into a fine paste. Add little water while grinding. Once it is done, add little water to bring to this to chutney consistency. In the remaining 1 tsp oil add the mustard seeds and when it splutters add that to the chutney. Mix well. Sever karuvepillai chutney with idli | dosa | adai or upma. You can add a small piece of tamarind to this chutney. In that case increase the quantity of green chili. If using tamarind roast this along with the dal. If you want to can add 2 tblsp of grated coconut to the chutney. Channa dal can be replaced with urad dal. You can add blaco urad dal to make it healthier.